The last time I made a gnocchi dish, I used store-bought gnocchi and said that I probably wouldn't be making it from scratch until I purchased a gnocchi board. Well, I still have yet to get the board, but I could not resist the recipe for homemade butternut squash gnocchi in this month's Sunset Magazine. I love the idea of replacing the potatoes traditionally used in gnocchi with different flavors and butternut squash is one of those delicious fall flavors that I'm seeing everywhere right now and am loving using in my own dishes. Coming soon, butternut squash soup with sage. Use a fork to poke holes in the butternut squash and microwave on high for 20 minutes (Sunset said 10 and this was definitely not enough for mine). When you cut the squash in half lengthwise after microwaving, remove the seeds and discard. You should be able to scrape out the flesh easily with a fork or spoon. If it is not tender enough, return the squash to the microwave and cook on high for a few more minutes at a time. Place 2 cups of butternut squash into a bowl with the salt, pepper and nutmeg and mix well. Add flour, 1 cup at a time, until it turns into a dough. Turn the dough out onto a flour surface and kneed, adding flour as necessary if too sticky. 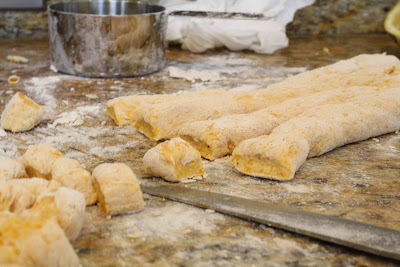 Cut the dough into four sections and roll out into ropes as shown below. Cut these ropes into small gnocchi pieces. Bring a large pot of water to a boil and salt liberally. Add gnocchi and cook for 5 - 6 minutes. Remove straight from the pot to a serving bowl with a slotted spoon. Toss gnocchi with butter and parmesan and add more seasoning to taste. Enjoy! Very unique, must have lots of good flavors. Beautiful photos on your blog. I seldom eat gnocchi. Only because I feel thatthe potatoes make it too heavy of a food. I'm excited to see you make it with butternut squash. I bet that the texture is much lighter. 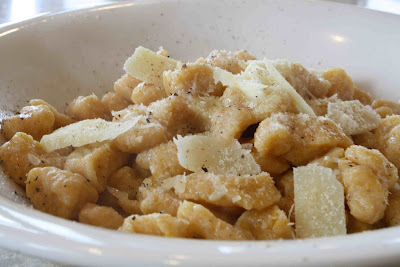 If I ever get the nerve to make homemade gnocchi I will be trying this recipe! I'm so happy you posted this- I have to make them- I keep saying I will and I haven't. My Grandmother always made her gnocchi from butternut squash- they were light and sooooooo full of flavor. I love them with my homemade sauce! Thanks again for the nudge! This is awesome! Gnocchi is the best, but even better with butternut squash. ooh my, this looks awesome. I guess you know I have a butternut squash sitting in my kitchen, too! I am so snagging this recipe! I love squash anything and who can say no to gnocchi???? Sounds delicious and a great change from potato. Yum! Plus the butternut squash makes it healthier! Do you read Jenn at Eatingbender's blog? You should send this to her because she is having a contest with a butternut squash recipe this week. truly... this represents two of my very favorite things... butternut squash and gnocchi. drool.